Great. Loved it. Would love to come back. Recommended to families. You do not have any coffee offered in your room. With the nightly rates they need to offer more in the room. Fresh breakfast crepes - very tasty and a great idea, but who knew that you had to wait over 30 minutes? it was just beautiful -and so much to do, we didn't leave Bellagio-the first night!! Flowers everywhere. Unfortunately it was some constructions during our stay. Very clean and the staff was excellent. Very nice view to the las vegas strip. Quiet,clean, comfortable. Casino had a lot of security noticeable. Tipped nicely at check-in but was disappointed with results. Staff at check-out tried to make up for it. No affordable coffee to be found. Top notch facility and you pay for it. Loved to pool atmosphere. Need to change up the music. If you are there for several days, same music over and over. 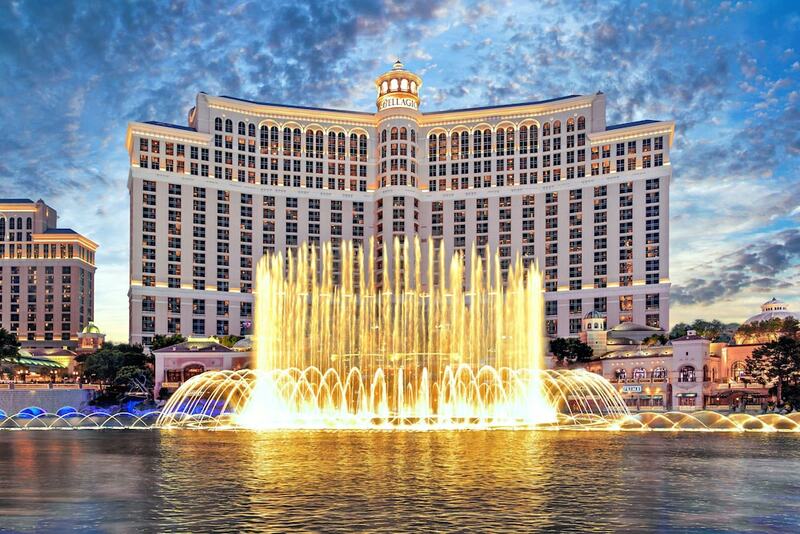 Located in Las Vegas Strip, Bellagio is within a 5-minute walk of Bellagio Conservatory & Botanical Gardens and within 15 minutes of other popular attractions like Park Theater. This 3933-room, 5-star resort welcomes business and leisure travelers with 5 outdoor pools, a full-service spa, and a casino. Relish the Asian cuisine at Jasmine, one of 13 onsite restaurants. Savor a meal from the privacy of your room with 24-hour room service, or get a pick-me-up at the coffee shop/café. For your convenience, a full breakfast is served for a fee each morning from 7:00 AM to 9:00 AM. Guests can expect to find WiFi and a flat-screen TV with pay movies. Pillowtop beds sport premium bedding and the bathroom offers a soaking tub, a hair dryer, and free toiletries. Other standard amenities include an iPod dock, a minibar, and a laptop-compatible safe. Bellagio features a full-service spa, 5 outdoor pools, and a casino. Parking is available for USD 18 per day (USD 30 per day for valet parking), and there's also limo/town car service. The front desk has multilingual staff on hand 24/7 to help with tours or tickets, dry cleaning/laundry, and luggage storage. Other amenities at this luxury resort include a nightclub, a health club, and a spa tub. It is encouraging to know your stay at Bellagio proved very positive and enjoyable. We invite you to experience Harvest by Roy Ellamar during your next trip to Las Vegas. A thoroughly modern dining experience awaits at Harvest, where Chef Roy Ellamar pairs market-fresh dishes with innovative preparation. Please visit us again, when next your travels bring you to town. Full breakfast is served daily from 7:00 AM to 9:00 AM for a fee. Jasmine - Restaurant specializing in Asian cuisine. Open daily for dinner. Picasso - Restaurant specializing in Mediterranean cuisine. Open daily for dinner. Prime Steakhouse - Restaurant and bar specializing in American cuisine. Open daily for dinner. Lago by Julian Serrano - Restaurant and bar specializing in Italian cuisine. Open daily. Spago by Wolfgang Puck - Restaurant specializing in American cuisine. Open daily for brunch, lunch, and dinner. The resort has 5 outdoor swimming pools and a seasonal outdoor pool. A health club, a spa tub, and a sauna are other recreation options. Guests under 18 years old are not allowed in the fitness facility. Vehicles that are self-parked for more than one hour are subject to a parking fee. The self-parking fee is USD 9 for vehicles parked 1-2 hours, USD 15 for vehicles parked 2-4 hours, and USD 18 for vehicles parked 4-24 hours. The valet parking fee is USD 21 for 0-2 hours, USD 24 for 2-4 hours, and USD 30 for 4-24 hours. All parking fees repeat each 24-hour period. The parking fee provides registered guests with in-out privileges within the same parking type (self or valet) across all MGM Resorts destinations. For details, please contact the property using the contact information found on the confirmation received after booking.